Hello. It is time for a new challenge at AAA Cards Challenges and Maaike picked the challenge of Tic Tac Toe. This was a fun challenge! For my card, I used gold, watercolours and flowers. To start this one, I took some watercolor cardstock and layered a few watercolors of blue and pink over it. Then I stamped the flowers with versamark and embossed them with gold. I used a rectangular die to trim it down and added the sentiment with some more embossing powder. I matted the panel to a top folding A2 white card. Well I can only think of one thing better than poppies and that's golden poppies! So pretty Cheryl. 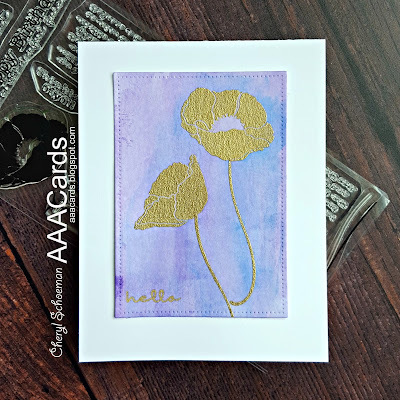 What a pretty card - I love the background and the gold poppies - at first I wondered if you had used gilding flakes but I was wrong - fabulous embossing! what an artsy looking card, the watercolor makes such a great background, so perfect for the gold flowers. Such a pretty card. Thanks for sharing at ATCAS! You created a beautiful background for the elegant gold embossed poppies, Cheryl. Thanks for sharing your card with us at Addicted to CAS.